Southeast football head coach Tom “Tuke” Matukewicz and Saint Francis Foundation executive director Jimmy Wilferth unveil the pink jerseys players will wear during the Pink Up football game on October 31. Bids may be placed through October 12 at www.pinkupcape.com. Saint Francis Medical Center and Southeast Missouri State University Athletics announced a new collaboration today, taking the Redhawks’ Pink Up efforts to a new level. 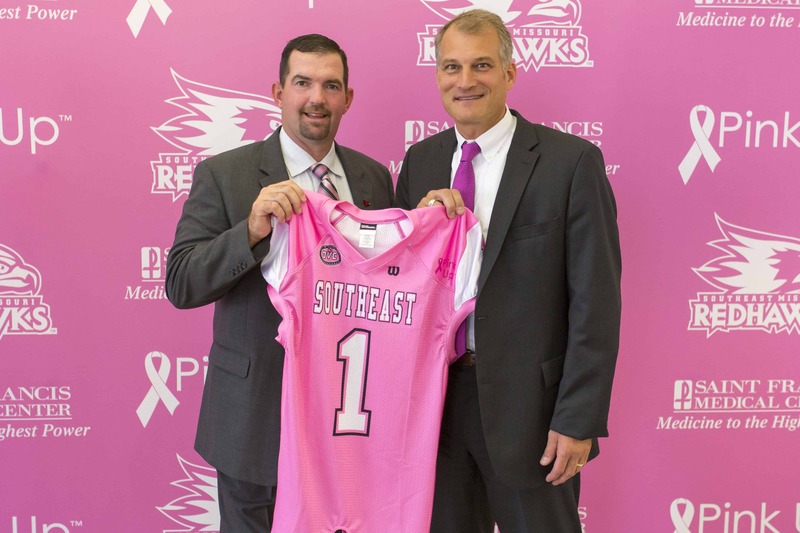 Led by head coach Tom “Tuke” Matukewicz, the Southeast football team introduced the Pink Up Jersey Auction, which opens today and will culminate with the Pink Up game on October 31. Pink jerseys will be worn during the Redhawks’ Pink Up game on October 31 against Tennessee Tech. Bidding on game-worn pink jerseys opened today at www.pinkupcape.com. After the auction closes at 11:59 pm on October 12, the winners will personalize their winning jerseys with a name in honor or memory of a survivor or loved one, if desired. After the game on October 31, the game-worn jerseys will be presented to the winning bidders. The winners will also receive two game tickets and an invitation to a pre-game tailgate party – all in honor of Pink Up. Saint Francis launched Pink Up in 2010 to raise awareness of breast cancer in the community. During the campaign, residents are encouraged to “pink up” their homes and businesses in support of the cause. Pink Up proceeds provide free mammograms to area women who otherwise could not afford them. Pink Up provides more than 400 free mammograms to local women each year, and has provided more than 2,600 free mammograms since 2000. Last year, more than 190 local businesses, 50 schools and countless individuals raised nearly $215,000 in support of the program. Breast cancer is the second-most diagnosed – and second-most fatal – cancer in women. One in eight women will be diagnosed with the disease in her lifetime, but early detection could save her life. Women age 40 and older should have a yearly screening and the Pink Up attempts to remove financial barriers for those who need the screening but cannot afford it. Please visit www.digforlife.com or call 573-331-5133to learn more or to donate to the cause.